The Magic: The Gathering street gang cop drama we need right now. 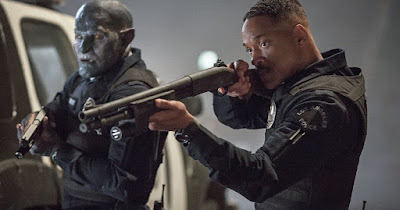 Adam: This week we’re reviewing Bright, Netflix’s entry into the holiday blockbuster sweepstakes starring Will Smith and Joel Edgerton as mismatched “buddy” cops, one a grizzled, cynical veteran and the other an Orc! 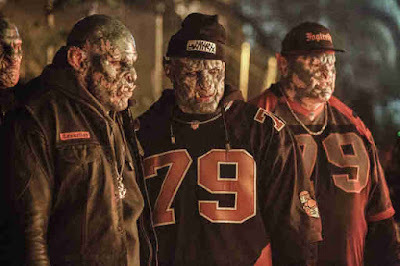 In a world where humans, Orcs and elves co-exist (at different class levels depending solely on species, it seems), the mismatched partners find themselves embroiled in a case involving dirty cops (we need to talk about the dirty cops), street gangs (because David Ayer), magic wands and knock-off Leeloos. Many of the reviews I read before and during my viewing of Bright pointed out what a strange film this is, and I completely agree with that statement. It’s like if the contents of a dumpster came together and became a movie. There are elements in the trash that are good, but when all mixed together it becomes something you want to throw out. Because the state of movies in 2017, Bright somehow achieves being Will Smith’s best movie in years, a rebound of sorts for David Ayer from the even worse Suicide Squad, Netflix’s most real movie/not TV movie to-date, and still pretty bad. Rob: I want to be careful with how I approach this because, honestly, we don’t need to pile on. The internet is hunting Bright for sport this week. Nor am I interested in having the Max Landis conversation (though maybe no one having the Max Landis conversation is what allowed him to get as far as he did), because there’s nothing new or productive there. I’ll just say this: Bright is a bad movie. It’s a Battlefield Earth-level catastrophe, a convoluted, self-serious mess that manages to make a world of orcs, witches, fairies, and elves schizophrenic and boring. Its obsession with worldbuilding completely overtakes its characters and narrative to the point where — somewhere between the introduction of the tenth new gang and the third new prophecy — I just threw up my hands and surrendered. 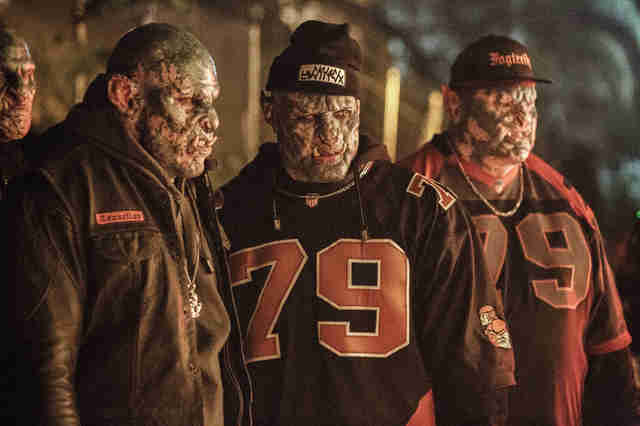 The movie simply cannot get out of its own way long enough to tell a coherent story, and David Ayer’s grimey, realistic point-of-view (though it feels like it should work here) is as misguided for this world as it was for Suicide Squad. I really wanted Bright to embrace its goofiness. It never does. But again, piling on. I think Bright is an incredibly ambitious idea (the world, not the “racism is bad” stuff) that might have worked as an eight-episode Netflix series or a comic book. This story desperately needs more room to breathe, and maybe hashing out a season-long arc might have allowed the creators to smooth some of the more baffling inconsistencies and give us more of a reason to invest in all these idiosyncratic characters. The standout is Joel Edgerton (for whom I seem to be an apologist), who’s really fun in a thankless role. I was with him for about the first hour before all the Orc Jesus stuff put me to sleep. Will Smith, on the other hand, is miscast. It’s not that he’s bad; it’s that his strengths as a movie star actually exacerbate the tonal problems with the rest of the movie. He draws too much attention to himself for the role he’s playing. Wait. Didn’t I say I wasn’t piling on? Bright makes it so hard not to. Adam: I think I’m going to be better at the not piling on than you are for Bright. I liked it more than you, but it wasn’t enough to tip the scale where I’m going to award it with a much heralded Mark Ahn. What did I like? The Joel Edgerton performance is the most interesting thing in the movie. I like that he played it as an Orc who was unsure of himself and not exactly a great cop. The production design, makeup, special effects are impressive -- even better than in some higher budgeted films currently playing in theaters. The soundtrack (which I’ve listened to a couple of times on my Amazon Music player) is solid. I give them credit for being a throwback and having a soundtrack, not just a generic score. I can see this world being interesting in different hands, etc. I don’t think the first hour of the movie is too bad, actually. It’s diverting for a little while. My biggest problems with Bright are that it jettisons anything of interest in the second hour (around the time Noomi Rapace arrives as the lead villain) and is trying to be something different every five minutes. Seriously, who is this movie for? In the end, no one, right? I can’t imagine there being a douchebro out there with a Scarface poster, eating buffalo wings, wearing a Lord of the Rings costume, writing End of Watch fanfiction. As for Will Smith, has there ever been an actor so clueless as to what made him popular? We want to see you be charming, ya goof! No one wants you sad and surly. You’ve done that to death. It’s depressing that he has such terrible taste in scripts. Plus, how does one of the most popular African-American actors ever think going for that “Fairy lives don’t matter” joke is a good idea? It’s beyond tone deaf. One more Bright gripe: if you’re going to have a movie full of crooked cops, maybe don’t hire Margaret Cho and Ike Barinholtz (who is terrible in his second straight David Ayer movie) and go for more grizzled character actors. 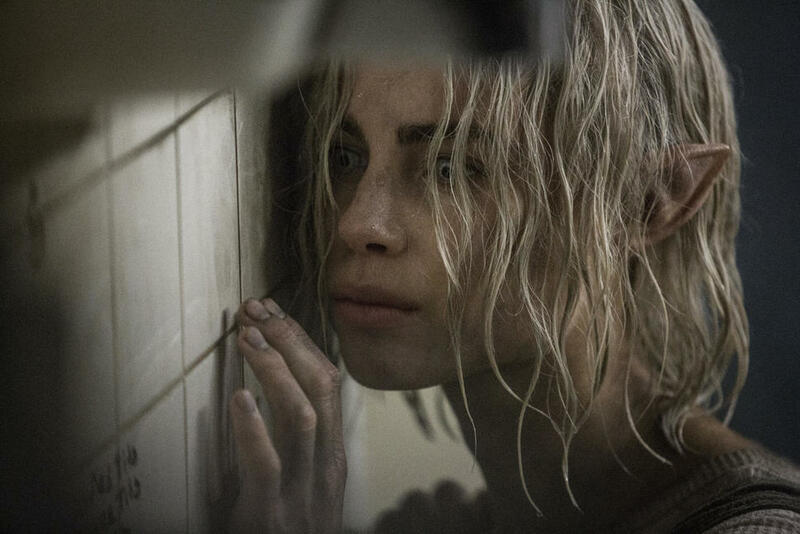 I don’t know really what else to say about Bright other than it’s one of the best things I’ve seen on Netflix and also a waste of time. Rob: That last line is going on the poster. I think I’m in the same boat as you are, sitting here thinking of what else to say about the movie. I think it’s a flawed expression of some interesting ideas. I think it wants to be this mythic, generation-defining morality tale, but it sort of runs out of steam and starts dipping its toes in other waters to fill up time, which muddles and distracts things away from its core. I think it’s the kind of thing people should keep trying to make, and maybe eventually we’ll get it right? I don’t know. I’m sort of warming to it because I don’t believe it was made as cynically or absent-mindedly as a lot of the things we’re asked to watch. But I still don’t like it at all, so I’m Marking Off on Bright. I hope that makes sense. Adam: It does. You know what’s amazing as we come to the end of the year? I’ve Mark Ahn’d a lot of movies in our column and I don’t think I would stop to watch very many of them if I stumbled upon them on cable. We are in a weird, generic place with film these days. The Circle is looking better every day. 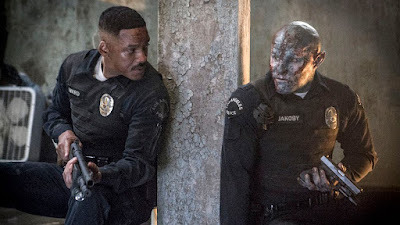 Before we close, I will say this for Bright: I wish this were a theatrical release, because it has just enough starpower and geek allure to be a mid-size hit. I think seeing this Christmas weekend with an audience in a shared “WTF” state of mind would have been fun. Rob: I was thinking that, too. I hope we sort out the midsize release conundrum soon. A lot of these movies deserve wider audiences than even Netflix can provide. As much as I didn’t connect with Bright, I certainly think it deserved a nice opening weekend. Anyway, happy holidays, buddy! Adam: Happy Holidays to you too! Will I see you again in February? I don’t even know how to rate movies anymore. It’s like: Is Bright good? No. Did I enjoy it more than The Post, I, Tonya and Three Billboards Outside Ebbing, Missouri? Yes. Are any of them more Oscar-worthy than 12 Dates of Christmas? No. Would I rather be watching football? Maybe. How do I feel about an all Orc defensive line? Maybe that will solve the issues raised in Will Smith’s film Concussion. Adam: These seats are reserved. Hey, do you think in 40 years people will be like “This doesn’t feel like Bright!” or “Ward and Jakoby wouldn’t do that!”? 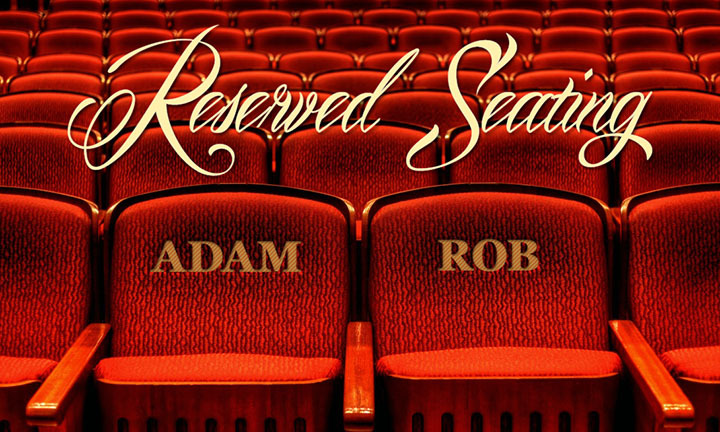 Rob: This is why we can’t have nice things, Adam. But hey, Bright II: The Rebrightening is on its way! Bright seems to be up there with The Last Jedi and Mother as one of the most divisive movies of 2017. I enjoyed it quite a bit, but after all the brutal reviews I adjusted my expectations and by the time it was over I was quite happy with it. I'd like to think that the fact that I'm watching this movie on Netflix isn't changing my opinion on the film if I had actually paid 10 bucks to see it, but I can't confidently say that. Its reach definitely exceeds its grasp, but I had enough fun with it that I would watch a sequel. I dig divisive. It always means the filmmakers are taking a chance. Sometimes I find that a divisive film can bring out the best in film fans, but I guess it can result in a lot of arguments as well. Can we pleeeeease cool it with the "movies are terrible these days" stuff? They're not. There were good movies, bad movies, and everything in between released this year, just like EVERY year. There are still totally midsize releases - it's just that big budgets have gotten bigger, so that makes midsize movies like The Shape of Water, Wonder, or Molly's Game looks small. I've always liked that F This Movie tries to find the good in the bad, but perhaps if you were more willing to hate on something like Bright (which I think is fair because Max Landis is the worst), you'd be willing to pile more praise on things that deserve it. I still like this column, because you guys always make good points, and I like your different points of view, but...maybe try to be a little more excited about new movies? Because I can guarantee you that in 20 years, people will be talking about how amazing 2010's movies were, compared to all the stuff that comes out in the 2030's. I will try to be more positive and/or keep my negativity to myself. Thanks for commenting. And Adam, just write/podcast on your honest feelings. I think that's all we really want! I'm genuinely thrilled that you saw so much you loved this year (of COURSE I am, because that's what we all want) so I am in no way challenging your assessment that the year has been great, but I have a genuine question that comes up every time of year when we start running our top 10s on the site. Why is it that whether we call it a "great year" for movies or not, are we always talking about the same 10 movies? This isn't a question I expect you to answer, Daniel. Just something that really stands out this week when we all run our lists of the same titles in slightly different orders. I saw a lot of movies I liked or thought were good this year but very few I fully loved, and that's 100% on me, not the fault of the movies. But even still, as I look around every other site's top 10 rankings, we're always talking about the same 10 movies, most of which were released in the last two months of the year. It's a phenomenon that I'm frustrated by but also in which I'm pretty complicit. Just thinking out loud, and obviously the comment section of this BRIGHT review is the place to do it. @Daniel-Thanks for commenting. I always love reading your enthusiasm and good humor even when a movie isn't great. This was really the year where I feel like I started to "see through" (that sounds harsh but it's honest) the Oscar-bait fare. E.G. I liked Darkest Hour but it's this year's Theory of Everything or The Imitation Game. I liked Call Me By Your Name but it's not as good as Brokeback Mountain or Moonlight. I loved Lady Bird but it reminded me a lot of Juno. I feel like I've seen it all at this point. In regards to people talking about the same movies, I think it’s because those are the ones that clearly announce themselves as really good movies. The ones that stand out as people’s all timers don’t reveal themselves right away. A movie like Planes, Trains, and Automobiles is a great example - I doubt it made many top ten lists that year but it’s on a lot now. It’s impossible to know which movies will stand the test of time, which is why top ten lists are always just a point in time, just like any review. I’m always interested to look at my Top Ten five years later and see how it changes. Cloud Atlas didn’t even make my Top Ten in 2012 but it’s prob my fav movie of that year now, after a bunch of rewatches. I bet there’ll be movies that didn’t totally work for us this year that’ll stand out in a few! I’d also recommend checking out foreign movies whenever you’re feeling burnt out on what’s in theatres. I watched the anime Your Name on a whim and it’s prob my fav movie this year, partly cuz it’s just so different than anything I’ve seen. Speaking only for myself, I’d classify my attitude as fatigued, not negative. Yes, movies will always be good and bad, but the amount of time and energy it takes to see movies, think about them, and write about them at a volume that allows us to provide weekly content can be exhausting. Sometimes it’s okay to reflect and regroup at the end of the year. We invest a lot of energy into this project, and it has to go somewhere. As for the midsize conversation: I was more expressing frustration with changing distribution models, not the movies themselves. Like you said, the change makes midsize movies feel smaller, which is what I think we were getting at. Thanks for responding! I can definitely understand feeling fatigued after a year of writing about movies, especially ones like Bright and Flatliners. Keep up the good work, and I hope that you both see some movies soon that will make seeing all the not so good ones worth it! It's very unfortunate that with the reach and pull Netflix has, it's falling into the same hamster wheel that the "theatrical" AAA studios are. “I can’t imagine there being a douchebro out there with a Scarface poster, eating buffalo wings, wearing a Lord of the Rings costume, writing End of Watch fanfiction.” - This is hands down the funniest line I’ve read in a review all year! Orcs are born linebackers aren't they? And I always thought a Ringwraith would make a mean free safety. I was hoping the elves were good at basketball. Personally, I didn't mind Bright, but I wasn't in love with the movie either. I found the universe way more interesting than the story if that makes any sense. You strip away the fantasy elements away from the movie and it's just a standard buddy cop movie, but I guess I did admire its ambition. Also, I agree with Rob, Bright would have probably worked better as a series as opposed to a movie. At least this way they could have explored the universe a little bit more. I've heard some people compared this to Alien Nation. Ironically, I've never seen Alien nation. Is Alien Nation worth watching?